Weekly Review - are we left in a new lower trading range now? Well, this week sure belonged to the bears. Here's the tally for the major averages: Dow down 6.2% for a new low, the S&P 500 down 6.9%, the NASDAQ down 6.1% and the Russell 2000 down 8.3%. Sheesh! Looking at charts, the averages are all at or below their lower Bollinger Band despite a late day rally on Friday. Some, in looking on the bright side, have pointed to the fact that the Dow is the only average to have hit a new low and that this divergence may signal a bounce. On the other hand, when looking at weekly charts, it can be seen that the S&P 500 has hit a new low based on weekly closing prices. This is illustrated in our two charts below where we compare some of the TradeRadar statistics to SPY, the S&P 500 SPDR ETF. On a weekly basis, the Russell 2000 is only a few points above its November low while the NASDAQ is really the only index that has not quite broken down to November levels. Bottom line is that all the averages showed a lot of weakness and it remains to be seen whether the usual "stocks are cheap" attitude will be enough to rejuvenate prices beyond what a short-term oversold bounce can provide. So what was different this week that prompted such a drop in stock prices? The usual toxic combination of banks and economic reports. As the U.K. government moved closer to nationalizing several banks, the discussion of nationalization of the worst banks in the U.S. began to grow in volume with various talking heads, pundits and bloggers taking up the topic. This struck fear into investors who proceeded to sell shares of Citi and Bank of America as well as most other stocks. Finally, on Friday afternoon, a White House spokesperson reiterated the administration position that they would prefer the banking system to remain in private hands. On Wednesday, the president announced a plan to aid homeowners facing foreclosure and, surprisingly, the market pretty much ignored it. The plan seemed reasonable, had a decent amount of detail and even included some incentive for banks. Wall Street, always looking for some reason to quibble, must have focused on the fact that jumbo mortgages will not be addressed. On the economic front, the New York Empire State manufacturing survey hit a new record low, showing manufacturing is still in free-fall. The news from the Philadelphia Fed was no better. Another record was set in the announcement of New Home Starts which fell to an annualized rate of 466K units in January, below the 529K consensus estimate. This is a 16.8% decline from December and is 56.2% below the year-ago level. Initial jobless claims came in above 600,000 again and continuing claims hit another record high. With the constant drip of bad economic news and the ongoing trainwreck in the financials, stocks didn't stand a chance. As you'll see below, our TradeRadar statistics are reflecting quite a bit of negativity this week. As mentioned above, SPY hit a new low in terms of weekly closing prices. Note that over the last two weeks the number of stocks above their 20-day MA has plunged to around 1200. This means that nearly 84% of stocks are now trading below their 20-day MA. That implies a lot of pessimism for stocks. It also implies that it won't be long before we see a lot more stocks trading below their 50-day MA, as well. Here we see the number of stocks in up-trends dropping from an already low number. More seriously, though, we also see the number of stocks in down-trends jumping up to 4000. That means that about 54% of all stocks we evaluated are in confirmed down-trends now. This is not exactly a signal of market strength. 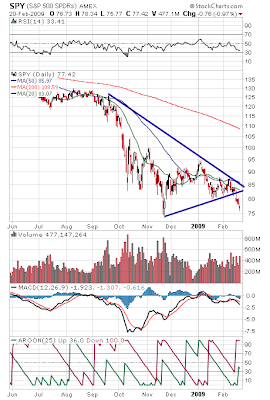 We've mentioned how SPY has hit a new closing low on the weekly chart. Below we have SPY on a daily chart. We have been drawing that triangle on the charts for weeks now. Well, we finally have a resolution of the pattern and it is a clear breakdown on decent volume. Generally, chartists will tell you that a break out of a pattern will yield a move that is about the size of the original pattern itself. If that plays out, we will see SPY down quite a bit more before we are done. Given that symmetrical triangles like we have here tend to be considered "continuation" patterns, this implies that there is more bearishness in store. To add fuel to the fire, the 20-day MA has crossed below the 50-day MA again. Talk of nationalization of the banks certainly spooked investors this week. Given that the FDIC does something similar when they take over insolvent banks, it is a little odd that the nationalization debate caused so much angst for investors. In the meantime, the drumbeat of poor economic reports continues. Thus far there has been little indication that the economy has bottomed and that likely helped drive this week's negative sentiment. Then there is the issue of price momentum which was definitely in the downward direction last week. There isn't one positive indicator on the chart of SPY above unless one wants to focus on RSI which indicates an oversold bounce could be in store this coming week. There is a good chance, however, that any bounce in SPY could stall out at $80, the former support level that has now become resistance. We have a modest number of economic reports this week: we'll see Consumer Confidence on Monday, Existing Home Sales on Wednesday, the Durable Goods Orders report on Thursday, and the revised Q4 GDP report on Friday as well as Chicago PMI. Investors will also be looking to Fed Chairman Bernanke's semi-annual monetary policy report on Tuesday for clues on what the Fed might be planning. As we have been so often lately, we're left looking to Washington for stock market stimulus in the form of new plans, announcements or bailouts or further denials that they will nationalize the banks. With earnings season drawing to a close, I can't see much on the horizon that would support investor enthusiasm for buying stocks. Could we be stuck in a new, lower trading range now? Time will tell.